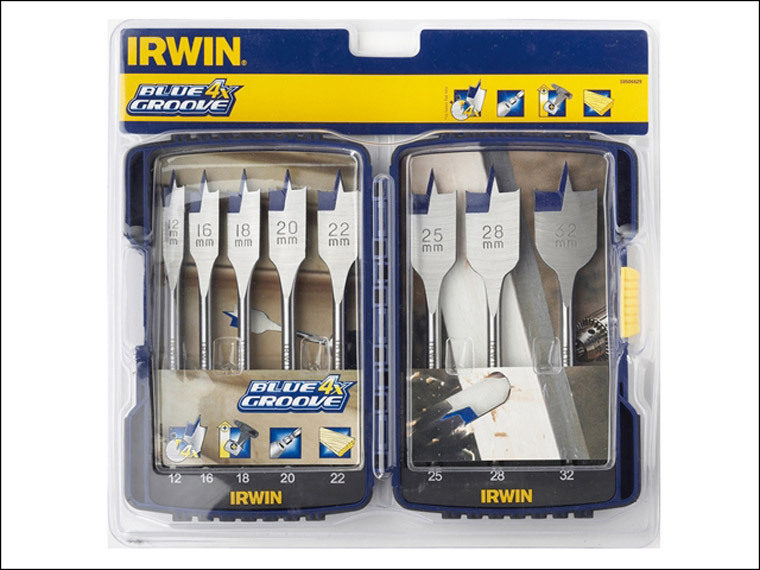 The Irwin Blue Groove 4X flat bit has a patented groove point and cutting edge. The cutting edges cut the timber 4 times faster, without scraping. The parabolic scoop optimises control and removal of wood chips. These flat bits have an increased relief angle from 12Ã‚Â° to 17Ã‚Â°. The large shank is 152mm in length and 10% larger in diameter for added durability. The Irwin IRW10506629 Blue Groove 4X flat bit 8 piece set includes the following pieces: 12, 16, 18, 20, 22, 25, 28 and 32mm diameter bits.